Unfortunately, this book is getting hard to find. Many books of similar content cost much more. And, this book provides an extensive dictionary of Latin botanical names and their meanings that is more than adequate for the average gardener. William Stearn enlightens us not only on the epithets of the words,i.e. odorata means smelly, but also on the history of why these names evolved. 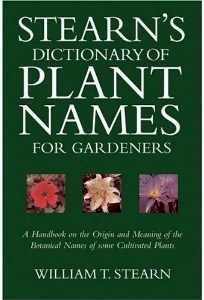 The name is the thing with this book just as it is with all plants. Many plants have species names that describe their leaves, flower colors, founders and region of origin. There is much history to be gained from the understanding this volume contributes. It can even be fun to learn what the names mean. For instance, Melissa (the genus for Lemon Balm) is also the name of a Cretan Princess who first learned how to get honey from bees. Because Lemon Balm attracts bees, Melissa is the perfect Genus for it. Armed with this wordy knowledge, we can actually make more appropriate plant choices for our gardens.